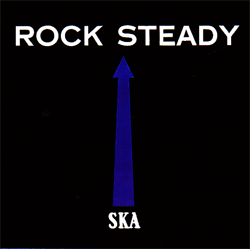 Deadly Dragon Sound â€“ Ska to RockSteady First came YEAR OF THE GUN. Next up was DEADLY DRAGON INNA SINGJAY STYLEE. Now Deadly Dragon Sound takes on the Foundation of Jamaican music with the new CD: DEADLY DRAGON â€“ SKA TO ROCK STEADY. In the 1960s, Ska music developed as the sound of Jamaica celebrating its independence from the United Kingdom. Record labels like Studio One, Duke Reid, Randys, Prince Buster and Top Deck pumped out records on a weekly basis expanding the stripped down beats of early ska into a dense patois of musical expression that rivals American Be-Bop for pure creativityâ€¦As the 60s progressed the initial joy of independence began to darken as the harsh economic realities of the post-colonial period began to come to light. Following this change in mood, the Ska music began slow down, to get more dread and finally morphed into the soul-inflected sound of Rock Steady. Be it hard instrumentals, loverâ€™s laments or rough-neck chants, the toughest tunes were always aimed at one group â€“ the RUDE BWOYS, the tough inner-city youth with no jobs, not much hope and the desire to make some serious noise before their time was doneâ€¦.. It is to the spirit of these RUDE BWOYS that we dedicate DEADLY DRAGON â€“ SKA TO ROCKSTEADYâ€”Yes indeed we dug deep into the vaults to find the most serious 45s and even a few Dub Plates to create a fluid mix that draws out the deep dread and millatancy of 60s Jamaican Music. So alla you Rude Bwoys get ready for this here Scorcher! DEADLY DRAGON â€“ SKA TO ROCKSTEADY covers 57 wicked pieces of vinyl (no blood-claat cds or Serrato mixed live and in real time with two turntables, a mixer and some effects -- NO overdubs, NO computer editsâ€“ just rude-bwoy music mixed in a rude-bwoy style for the massive dem! BIG UPS!!!!!! !